With Azure Load Balancer, you can scale your applications and create high availability for your services. Load Balancer supports inbound and outbound scenarios, provides low latency and high throughput, and scales up to millions of flows for all TCP and UDP applications. Load Balancer distributes new inbound flows that arrive on the Load Balancer's frontend to backend pool instances, according to rules and health probes. Additionally, a public Load Balancer can provide outbound connections for virtual machines (VMs) inside your virtual network by translating their private IP addresses to public IP addresses. Azure Load Balancer is available in two SKUs: Basic and Standard. There are differences in scale, features, and pricing. Any scenario that's possible with Basic Load Balancer can also be created with Standard Load Balancer, although the approaches might differ slightly. As you learn about Load Balancer, it is important to familiarize yourself with the fundamentals and SKU-specific differences. Azure provides a suite of fully managed load-balancing solutions for your scenarios. If you are looking for Transport Layer Security (TLS) protocol termination ("SSL offload") or per-HTTP/HTTPS request, application-layer processing, review Application Gateway. If you are looking for global DNS load balancing, review Traffic Manager. Your end-to-end scenarios might benefit from combining these solutions as needed. What are Load Balancer resources? A Load Balancer resource can exist as either a public Load Balancer or an internal Load Balancer. The Load Balancer resource's functions are expressed as a front end, a rule, a health probe, and a backend pool definition. You place VMs into the backend pool by specifying the backend pool from the VM. Load Balancer resources are objects within which you can express how Azure should program its multi-tenant infrastructure to achieve the scenario that you want to create. There is no direct relationship between Load Balancer resources and actual infrastructure. Creating a Load Balancer doesn't create an instance, and capacity is always available. With Azure Load Balancer, you can create a load-balancing rule to distribute traffic that arrives at frontend to backend pool instances. Load Balancer uses a hash-based algorithm for distribution of inbound flows and rewrites the headers of flows to backend pool instances accordingly. A server is available to receive new flows when a health probe indicates a healthy backend endpoint. By default, Load Balancer uses a 5-tuple hash composed of source IP address, source port, destination IP address, destination port, and IP protocol number to map flows to available servers. You can choose to create affinity to a specific source IP address by opting into a 2- or 3-tuple hash for a given rule. All packets of the same packet flow arrive on the same instance behind the load-balanced front end. When the client initiates a new flow from the same source IP, the source port changes. As a result, the 5-tuple might cause the traffic to go to a different backend endpoint. With Load Balancer, you can create an inbound NAT rule to port forward traffic from a specific port of a specific frontend IP address to a specific port of a specific backend instance inside the virtual network. This is also accomplished by the same hash-based distribution as load balancing. Common scenarios for this capability are Remote Desktop Protocol (RDP) or Secure Shell (SSH) sessions to individual VM instances inside the Azure Virtual Network. You can map multiple internal endpoints to the various ports on the same frontend IP address. You can use the frontend IP addresses to remotely administer your VMs over the internet without the need for an additional jump box. Every endpoint is only answered by a VM. For example, a TCP handshake always occurs between the client and the selected backend VM. A response to a request to a front end is a response generated by backend VM. When you successfully validate connectivity to a frontend, you are validating the end to end connectivity to at least one backend virtual machine. Application payloads are transparent to Load Balancer and any UDP or TCP application can be supported. For workloads which require per HTTP request processing or manipulation of application layer payloads (for example, parsing of HTTP URLs), you should use a layer 7 load balancer like Application Gateway. Because Load Balancer is agnostic to the TCP payload and TLS offload ("SSL") is not provided, you can build end to end encrypted scenarios using Load Balancer and gain large scale-out for TLS applications by terminating the TLS connection on the VM itself. For example, your TLS session keying capacity is only limited by the type and number of VMs you add to the backend pool. If you require "SSL offloading", application layer treatment, or wish to delegate certificate management to Azure, you should use Azure's layer 7 load balancer Application Gateway instead. Load Balancer instantly reconfigures itself when you scale instances up or down. Adding or removing VMs from the backend pool reconfigures the Load Balancer without additional operations on the Load Balancer resource. To determine the health of instances in the backend pool, Load Balancer uses health probes that you define. When a probe fails to respond, the Load Balancer stops sending new connections to the unhealthy instances. Existing connections are not affected, and they continue until the application terminates the flow, an idle timeout occurs, or the VM is shut down. Load Balancer provides different health probe types for TCP, HTTP, and HTTPS endpoints. Additionally, when using Classic cloud services, an additional type is allowed: Guest agent. This should be considered to be a health probe of last resort and is not recommended when other options are viable. All outbound flows from private IP addresses inside your virtual network to public IP addresses on the internet can be translated to a frontend IP address of the Load Balancer. When a public front end is tied to a backend VM by way of a load balancing rule, Azure programs outbound connections to be automatically translated to the public frontend IP address. Enable easy upgrade and disaster recovery of services, because the front end can be dynamically mapped to another instance of the service. Easier access control list (ACL) management to. ACLs expressed in terms of frontend IPs do not change as services scale up or down or get redeployed. Translating outbound connections to a smaller number of IP addresses than machines can reduce the burden of whitelisting. For more information, see outbound connections. Standard Load Balancer has additional SKU-specific capabilities beyond these fundamentals. Review the remainder of this article for details. Load Balancer supports both Basic and Standard SKUs, each differing in scenario scale, features, and pricing. Any scenario that's possible with Basic Load Balancer can be created with Standard Load Balancer as well. In fact, the APIs for both SKUs are similar and invoked through the specification of a SKU. The API for supporting SKUs for Load Balancer and the public IP is available starting with the 2017-08-01 API. Both SKUs have the same general API and structure. However, depending on which SKU you choose, the complete scenario configuration might differ slightly. Load Balancer documentation calls out when an article applies only to a specific SKU. To compare and understand the differences, see the following table. For more information, see Standard Load Balancer overview. New designs should adopt Standard Load Balancer. Standalone VMs, availability sets, and virtual machine scale sets can be connected to only one SKU, never both. When you use them with public IP addresses, both Load Balancer and the public IP address SKU must match. Load Balancer and public IP SKUs are not mutable. It is a best practice to specify the SKUs explicitly, even though it is not yet mandatory. At this time, required changes are being kept to a minimum. If a SKU is not specified, it is interpreted as an intention to use the 2017-08-01 API version of the Basic SKU. Standard Load Balancer is a new Load Balancer product and largely a superset of Basic Load Balancer. There are important and deliberate differences between the two products. Any end-to-end scenario that's possible with Basic Load Balancer can also be created with Standard Load Balancer. If you're already used to Basic Load Balancer, you should familiarize yourself with Standard Load Balancer to understand the latest changes in behavior between Standard and Basic and their impact. Review this section carefully. Backend pool size Supports up to 1000 instances. Supports up to 100 instances. Backend pool endpoints Any virtual machine in a single virtual network, including blend of virtual machines, availability sets, virtual machine scale sets. Virtual machines in a single availability set or virtual machine scale set. Health probe down behavior TCP connections stay alive on instance probe down and on all probes down. TCP connections stay alive on instance probe down. All TCP connections terminate on all probes are down. Availability Zones In Standard SKU, zone-redundant and zonal frontends for inbound and outbound, outbound flows mappings survive zone failure, cross-zone load balancing. Not available. Diagnostics Azure Monitor, multi-dimensional metrics including byte and packet counters, health probe status, connection attempts (TCP SYN), outbound connection health (SNAT successful and failed flows), active data plane measurements Azure Log Analytics for public Load Balancer only, SNAT exhaustion alert, backend pool health count. HA Ports Internal Load Balancer Not available. Secure by default Public IP, public Load Balancer endpoints, internal Load Balancer endpoints are closed to inbound flows unless whitelisted by a network security group. Open by default, network security group optional. Outbound connections You can explicitly define pool-based outbound NAT with outbound rules. You can use multiple frontends with per load balancing rule opt-out. An outbound scenario must be explicitly created for the virtual machine, availability set, virtual machine scale set to use outbound connectivity. Virtual Network Service Endpoints can be reached without defining outbound connectivity and don't count towards data processed. 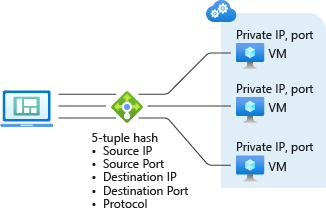 Any public IP addresses, including Azure PaaS services not available as VNet Service Endpoints, must be reached via outbound connectivity and count towards data processed. When only an internal Load Balancer is serving a virtual machine, availability set, or virtual machine scale set, outbound connections via default SNAT aren't available; use outbound rules instead. Outbound SNAT programming is transport protocol specific based on protocol of the inbound load balancing rule. Single frontend, selected at random when multiple frontends are present. When only internal Load Balancer is serving a virtual machine, availability set, or virtual machine scale set, default SNAT is used. Outbound Rules Declarative outbound NAT configuration, using public IP addresses or public IP prefixes or both, configurable outbound idle timeout (4-120 minutes), custom SNAT port allocation Not available. Management Operations Most operations < 30 seconds 60-90+ seconds typical. SLA 99.99% for data path with two healthy virtual machines. Not applicable. Pricing Charged based on number of rules, data processed inbound and outbound associated with resource. No charge. For more information, see service limits for Load Balancer. For Standard Load Balancer details, see overview, pricing, and SLA. A public Load Balancer maps the public IP address and port number of incoming traffic to the private IP address and port number of the VM, and vice versa for the response traffic from the VM. By applying load-balancing rules, you can distribute specific types of traffic across multiple VMs or services. For example, you can spread the load of web request traffic across multiple web servers. The following figure shows a load-balanced endpoint for web traffic that is shared among three VMs for the public and TCP port 80. These three VMs are in a load-balanced set. When internet clients send webpage requests to the public IP address of a web app on TCP port 80, Azure Load Balancer distributes the requests across the three VMs in the load-balanced set. For more information about Load Balancer algorithms, see the Load Balancer features section of this article. By default, Azure Load Balancer distributes network traffic equally among multiple VM instances. You can also configure session affinity. For more information, see Load Balancer distribution mode. An internal Load Balancer directs traffic only to resources that are inside a virtual network or that use a VPN to access Azure infrastructure. In this respect, an internal Load Balancer differs from a public Load Balancer. Azure infrastructure restricts access to the load-balanced frontend IP addresses of a virtual network. Frontend IP addresses and virtual networks are never directly exposed to an internet endpoint. Internal line-of-business applications run in Azure and are accessed from within Azure or from on-premises resources. Within a virtual network: Load balancing from VMs in the virtual network to a set of VMs that reside within the same virtual network. 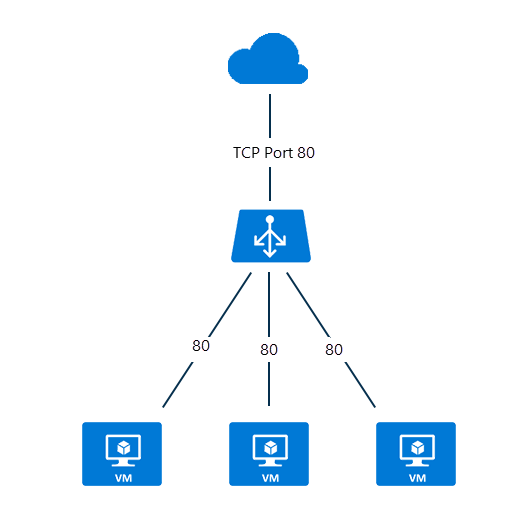 For a cross-premises virtual network: Load balancing from on-premises computers to a set of VMs that reside within the same virtual network. For multi-tier applications: Load balancing for internet-facing multi-tier applications where the backend tiers are not internet-facing. The backend tiers require traffic load-balancing from the internet-facing tier (see the next figure). 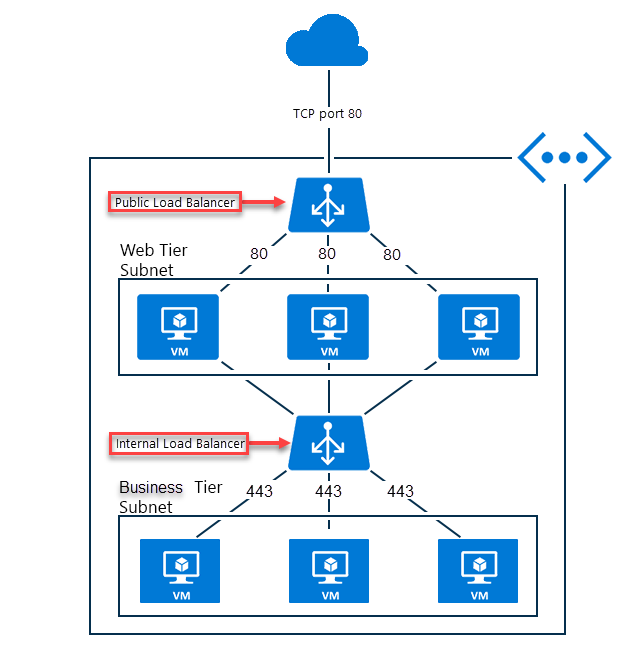 For line-of-business applications: Load balancing for line-of-business applications that are hosted in Azure without additional load balancer hardware or software. This scenario includes on-premises servers that are in the set of computers whose traffic is load-balanced. Standard Load Balancer usage is charged. Amount of data processed inbound and outbound irrespective of rule. For Standard Load Balancer pricing information, go to the Load Balancer pricing page. Basic Load Balancer is offered at no charge. For information about the Standard Load Balancer SLA, go to the Load Balancer SLA page. Load Balancer is a TCP or UDP product for load balancing and port forwarding for these specific IP protocols. Load balancing rules and inbound NAT rules are supported for TCP and UDP and not supported for other IP protocols including ICMP. Load Balancer does not terminate, respond, or otherwise interact with the payload of a UDP or TCP flow. It is not a proxy. Successful validation of connectivity to a frontend must take place in-band with the same protocol used in a load balancing or inbound NAT rule (TCP or UDP) and at least one of your virtual machines must generate a response for a client to see a response from a frontend. Not receiving an in-band response from the Load Balancer frontend indicates no virtual machines were able to respond. It is not possible to interact with a Load Balancer frontend without a virtual machine able to respond. This also applies to outbound connections where port masquerade SNAT is only supported for TCP and UDP; any other IP protocols including ICMP will also fail. Assign an instance-level Public IP address to mitigate. Unlike public Load Balancers which provide outbound connections when transitioning from private IP addresses inside the virtual network to public IP addresses, internal Load Balancers do not translate outbound originated connections to the frontend of an internal Load Balancer as both are in private IP address space. This avoids potential for SNAT port exhaustion inside unique internal IP address space where translation is not required. The side effect is that if an outbound flow from a VM in the backend pool attempts a flow to frontend of the internal Load Balancer in which pool it resides and is mapped back to itself, both legs of the flow don't match and the flow will fail. If the flow did not map back to the same VM in the backend pool which created the flow to the frontend, the flow will succeed. When the flow maps back to itself the outbound flow appears to originate from the VM to the frontend and the corresponding inbound flow appears to originate from the VM to itself. From the guest OS's point of view, the inbound and outbound parts of the same flow don't match inside the virtual machine. The TCP stack will not recognize these halves of the same flow as being part of the same flow as the source and destination don't match. When the flow maps to any other VM in the backend pool, the halves of the flow will match and the VM can successfully respond to the flow. The symptom for this scenario is intermittent connection timeouts when the flow returns to the same backend which originated the flow. There are several common workarounds for reliably achieving this scenario (originating flows from a backend pool to the backend pools respective internal Load Balancer frontend) which include either insertion of a proxy layer behind the internal Load Balancer or using DSR style rules. Customers can combine an internal Load Balancer with any 3rd party proxy or substitute internal Application Gateway for proxy scenarios limited to HTTP/HTTPS. While you could use a public Load Balancer to mitigate, the resulting scenario is prone to SNAT exhaustion and should be avoided unless carefully managed. You now have an overview of Azure Load Balancer. To get started with using a Load Balancer, create one, create VMs with a custom IIS extension installed, and load-balance the web app between the VMs. To learn how, see the Create a Basic Load Balancer quickstart.